For those of you who are still suffering under a heat wave or are expecting a hot summer. It has happened again. 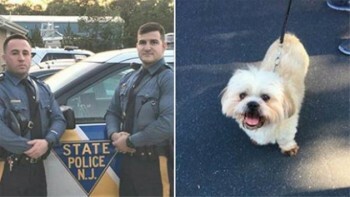 Police in New Jersey had to rescue a dog (and a two-legger!) who had been accidentally locked in a hot car. WPVI, 6-Action News, the ABC affiliate in Philadelphia reports on the scary incident. Grandma put the dog and 2-year old in the car, then went around to get in on the other side, but quickly found out she had left her keys inside the car. She quickly called 911, and New Jersey Troopers were able to get both of the car’s occupants out in time to prevent any real health issues. It’s never just a minute. And the car heats up really fast! Remember when you were a kid and held a magnifying glass over a bug? Your car windows act the same way that magnifying glass did. If you can’t leave the car and air conditioner running, don’t leave your dog in the car! Danger! Danger! Hot Cars in Season! How Many Dogs Have to Die? Don’t Police K-9 Handlers Receive any Training??? ?